Have you measured your joy level lately? We count the miles we jog or the steps we walk and we track our bank accounts. 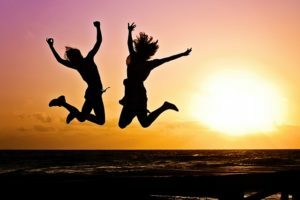 What if we quantified our daily joy? Our joy goes up when we’re praised at work, or when that big home repair is finally done, or when our child does better in school. But there’s always plenty to push joy aside: health issues; difficult relationships; demands of the job; a hectic schedule and lack of sleep. This series of blogs (which started here) is about serving God as he has gifted and called us to serve. Often, our serving is done willingly, but not exactly joyfully. We complete our obligations, mark the tasks off our list, and move on, hoping for a little time to enjoy ourselves when the work is done. “He’s calling you!” We are personally called to specific acts of service. “On your feet!” We learn about our callings by getting up and doing things. “Cheer up!” Attitude is important. When it comes to serving, we might not always feel cheerful about it. Some of our tasks are difficult; they test us and involve pain. Just ask the 80-year-old caring for a spouse with dementia. But no matter the circumstances, we have joy in knowing our grace-filled Father who loves us beyond measure, who is with us every step of the way, who forgives every failing, and who promises us a forever life with him filled with joys beyond imagining. This is an unquenchable joy that throbs in our soul even when our eyes fill with tears and our body with pain. What’s your joy level today? May each of us be on our feet, filled with joy, doing the work God has gifted us for and called us to do! Consider: How many reasons for joy do you count in Psalm 100? See how many reasons for joy you can list on a piece of paper. Pray: Dear God, you are powerful. You are good. And, wonder of wonders, you love me. Help the joy in me to grow day by day. (This blog is the fifth in a series of blogs titled “Cheer Up! On Your Feet! He’s Calling You!” The series begins here.